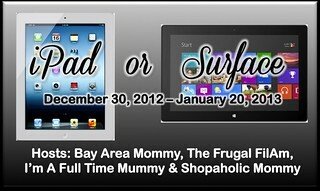 Welcome to the iPad or Surface giveaway event hosted by Bay Area Mommy, The Frugal FilAm, I’m A Full Time Mummy and Shopaholic Mommy! Get a chance to win either a 16GB iPad with retina display ($499) or a 32GB Microsoft Surface Tablet ($499)!!! Already have a tablet? No problem! You can opt for the cash equivalent via Paypal! Giveaway runs from December 30, 2012 at 12:01AM EST through January 20, 2013 at 11:59pm EST. Open worldwide. If winner is outside the US, he/she will get the cash equivalent. Must be 18 years or older to be eligible. Which would you choose if you won? I have an iPad already (and it’s awesome!) so I might lean towards getting the Microsoft Surface Tablet. Thank you for sharing! 😀 Hoping to win this great giveaway. I could use an ipad! Thank you for having this giveaway! Wishing you a blessed New Year! Thank you for such a great site! thank you for giving us the opportunity to win!! This is an awesome giveaway! Thank you so much for making this offer, I can’t wait to see who is the lucky winner! Thanks for hosting such great giveaways. Could really use this! Thank you so very much for all that you do! You are so very much appreciated. It must be a lot of hard work and deditcation running a blog. I think you are great! Thank you very much for having this great giveaway! This is great giveaway from a awesome website! Thank you so much for the amazing opportunity! Thank you for taking the time to make this giveaway possible! Wouldlove to win the iPad. Thanks for this great giveaway! Have a great new year! Thanks for a great chance to win a great giveaway! What a cool giveaway! Thanks for the chance! Thank you so much for such an awesome chance to win! Sweet giveaway! So many uses for this in my classroom! Would love to have an ipad for my students to use! picket fence link is not workin today . it took me to a page of computer code. the raflecopter said to click enter so i did. I hope this does not mess up my entries. I thank you for the opportunity to win a tablet etc. I cannot afford to purchase one, so it is nice to get a chance to win won. Keep up the good work. i have been trying so hard to win one of these thanks so much for this chance!!! My fingers are crossed! Thanks for the chance! you got some great giveaways. thanks! Thanks so much for making this giveaway possible. I would really love to win a tablet.